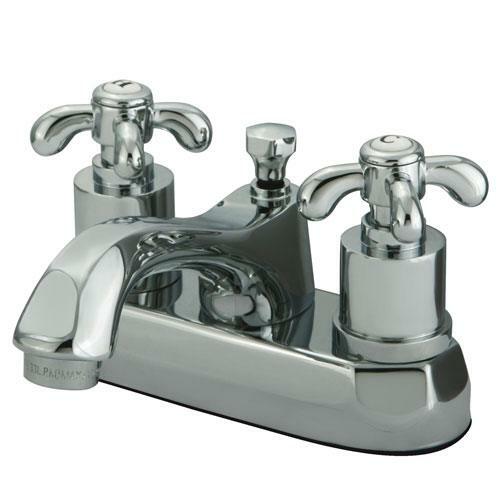 Kingston Brass Chrome French Country 4-inch Center Set Bathroom Faucet KS4261TX: This French Country 4-inch Center Set Bathroom Faucet is built to last. The highest quality standards are used to precision manufacturer a top of the line product. Important features of this BRAND NEW Fixture: Complete Item! Everything necessary for installation is included. - Solid Metal Cross Handle - Matching Accessories Available - Easy to Install - Installation instructions included - French Country 4-inch Center Set Bathroom Faucet - The charm of the French Country product comes from their cross handle levers and hook-shaped spouts. The 4-inch centerset lavatory faucet exhibits a traditional European glamour built in high quality brass for long-lasting use and gleams with its stunning chrome polish finish. - High Quality Brass Construction - 1/4 Turn Ceramic Disk Cartridge - Chrome premier finish designed to resist fading and tarnishing. This fixture is manufactured by Kingston Brass and is part of their French Country collection. The charm of the French Country product comes from their cross handle levers and hook-shaped spouts. The 4" centerset lavatory faucet exhibits a traditional European glamour built in high quality brass for long-lasting use and gleams with its stunning chrome polish finish.